N.trimaculana (ws 15-17mm) is the smallest of the three, but there is considerable overlap in size range with N.rosaecolana (16-20mm), though not with N.roborana (18-21mm) if we believe Clifton & Wheeler, though BTM gives a wider size range (16-22mm) for N.roborana. 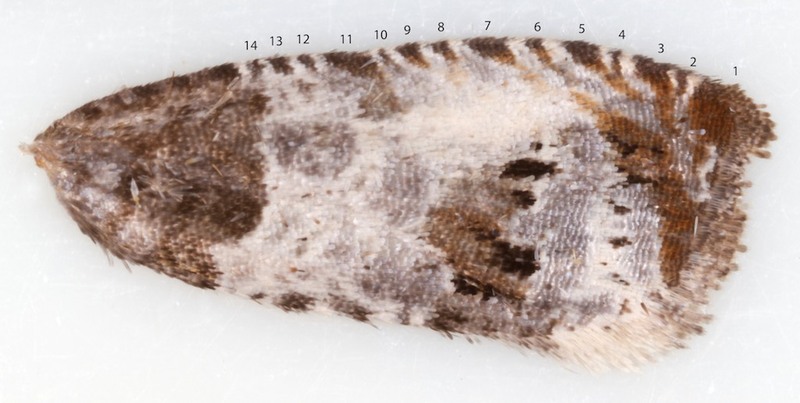 The costal strigulae in the distal half of the forewing generally consist of alternating broad and narrow marks in all three species, though there is some variation within species in the exact pattern of these markings. In N.rosaecolana the broadest marks are distinctly narrower than those in N.trimaculana/roborana. 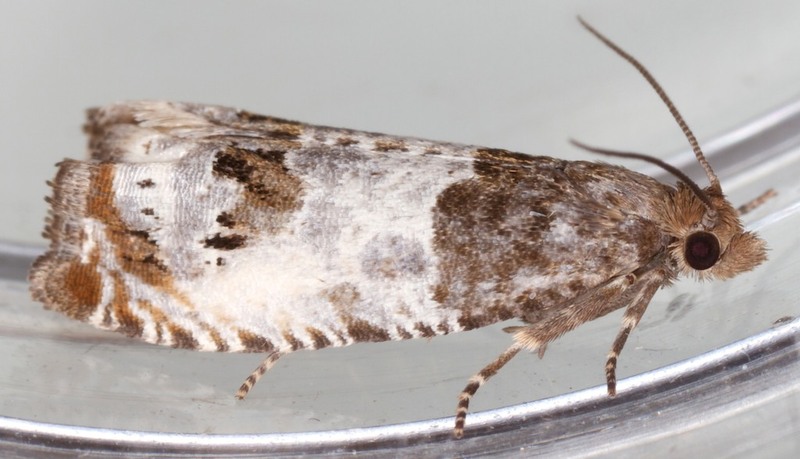 There are consequently more costal strigulae in N.rosaecolana. 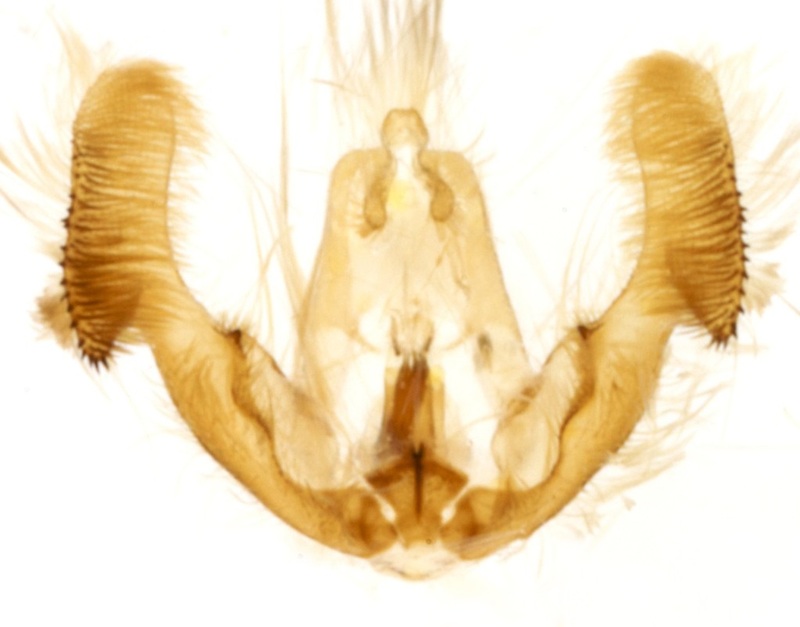 BTM also comments that the strigulae are more oblique in N.rosaecolana. Counting costal strigulae from apex to basal patch is complicated by the fact that males have a costal fold and the basal patch extends along the costa between costa and fold*. The costal fold extends to 1/2 in N.trimaculana/roborana and to 2/5 in N.trimaculana. N.trimaculana is also said to have a narrower forewing with a less strongly curved costa than N.rosaecolana. 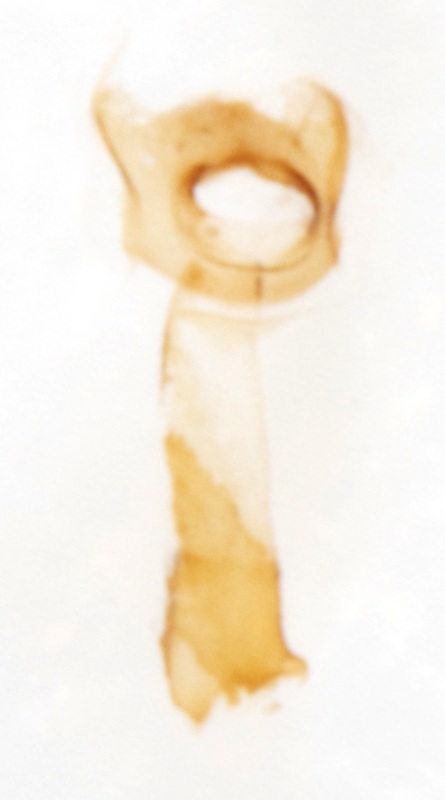 * Clifton and Wheeler states that this extension of the basal patch along the costa is diagnostic for N.roborana. I think this is incorrect without the further qualifications of fw length (which excludes N.trimaculana) and extent of costal fold (which excludes N.rosaecolana). Costal strigulae broad: there are 3 broad costal strigulae (numbered 3,4 & 6) and 2 to 4 narrow strigulae between the apical spot (1) and the fold. There is a diffuse broad strigula within the extension of the basal patch along the costa (which is present as a further distinct broad strigula in the female) If this strigula is included there are 4 broad strigulae and ~4 narrow strigulae between the apical spot and the basal patch. Costal fold intersects costa at 2/5 (0.38 in this example) and the fold is more curved towards the costa in this example at least. Forewing ratio broader (2.42 in this example) but this does not seem convincingly distinctive. Costal strigulae narrow: Although some are broader than others it is much less easy to discern 'broad' and 'narrow' strigulae than in N.trimaculana. 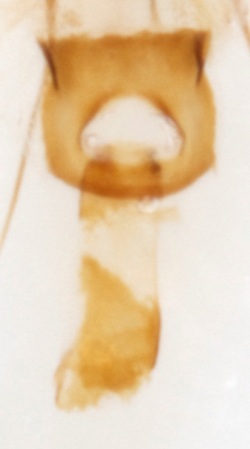 There are 13 strigulae between the apical spot and the fold (though strictly number 6 in this image is a stria rather than a strigula). Strigulae within the extension of the basal fascia along the costa to its intersection with the fold are very diffuse but probably number two, making a total of 15 strigulae between apical spot and basal patch. Costal strigulae broad: there are 3 broad costal strigulae (numbered 3,5 & 7) and 4 narrow strigulae between the apical spot (1) and the fold. The pre-tornal spot and median fascia are less well-devloped in N.roborana compared with N.trimaculana - giving a relatively uninterrupted patch of white ground colour between the basal patch and subterminal fascia. This example shows 2 more costal strigulae than females of the other two species, with strigulae 3,5,7 and 11 being broad. 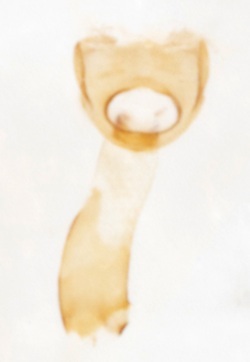 Strigula 11 seems to be equivalent to strigula 9 of the other two species and probably represents the costal end of an obsolescent median fascia. Note that the costa appears more arched in this species. The 4 broad costal strigulae, here numbered 3,5,7&9, are as in the male except that strigula 9 is more distinct. There appear to be 7 narrow strigulae between the apical spot and the basal patch. Possible distinctions between this species and N.trimaculana are the position of the angle in the distal margin of the basal fascia; the distance between the distal margin of the basal fascia and the rather diffuse proximal margin of the median fascia and this number of dorsal strigulae between basal and median fasciae. 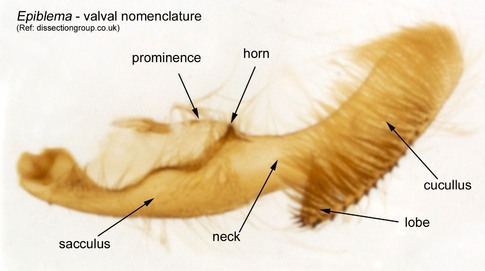 Regarding the whole illustrated part as the valva, N.roborana is readily distinguished by 3 valval features: 1) neck as broad as valva at sacculus*; 2) cucullus short and broad; 3) ventral margin scalloped. In comparison, N.trimaculana/rosaecolana both have a narrowed neck, elongate cucullus and an evenly convex ventral margin; and they are very similar to each other. N.rosaecolana has a pointed cucullar lobe while in N.trimaculana this lobe is rounded. DIssection group give 4 further features which I have so far found unconvincing - features for E.trimaculana given first: 1) sacculus* fairly narrow vs fairly broad; 2) cucullus parallel vs slightly tapering upwards; 3) prominence weakly curved vs strongly curved; 4) socii short vs long. *Dissection group refers to the sacculus as the whole width of the base of the 'valva'; my understanding is that strictly the sacculus refers only to the ventral portion. 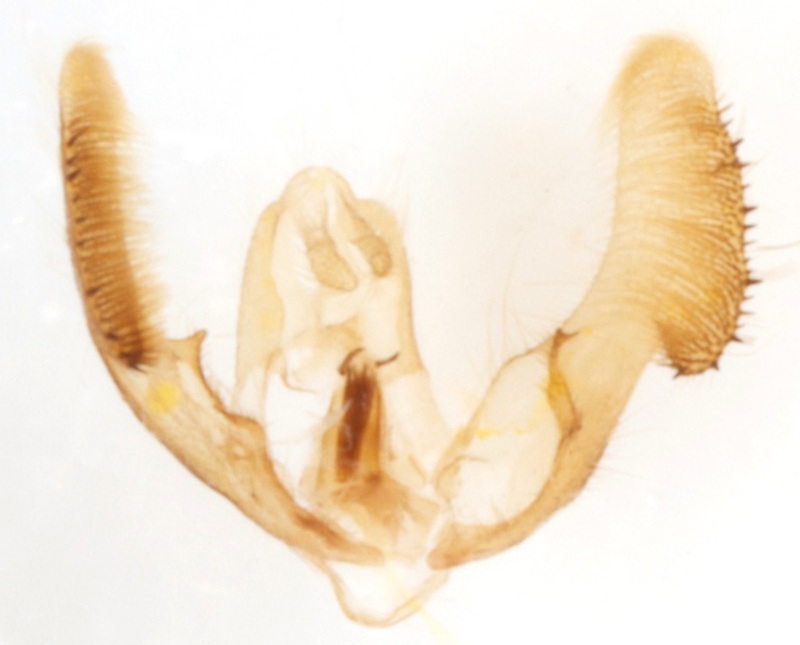 All three species have a similar ovipositor, sclerotised posterior section of the ductus bursae and 2 thorn-like signa in the bursa copulatrix. Differences between the species occur in the margins of the periosteal plate. According to Pierce and Metcalfe the posterior border of the periosteal plate is straight in N.roborana; and the sides of the periosteal plate are parallel in N.trimaculana and indented in N.rosaecolana. All 3 species are shown at dissection group. 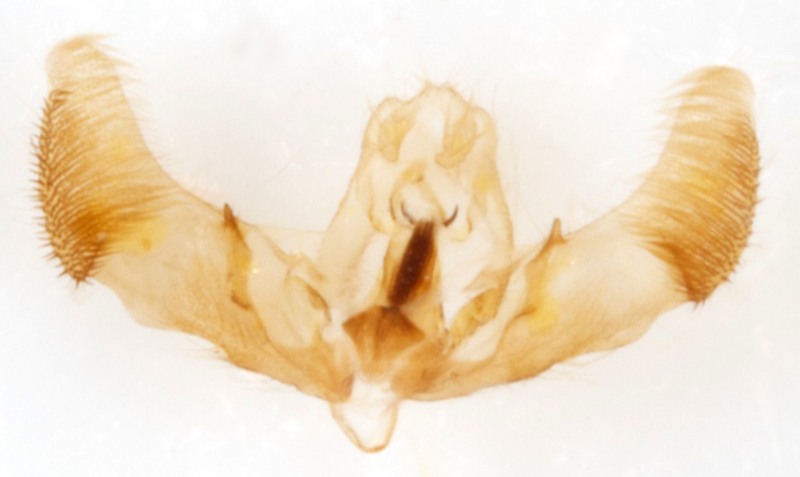 The straight posterior edge in N.roborana does seem to be distinctively different from the rounded centre and projecting posterior corners of N.trimaculana/N.rosaecolana. However the difference between N.trimaculana and N.rosaecolana seems to be less absolute, with some degree of indentation apparent in N.trimaculana. These two species are probably better separated on forewing features.